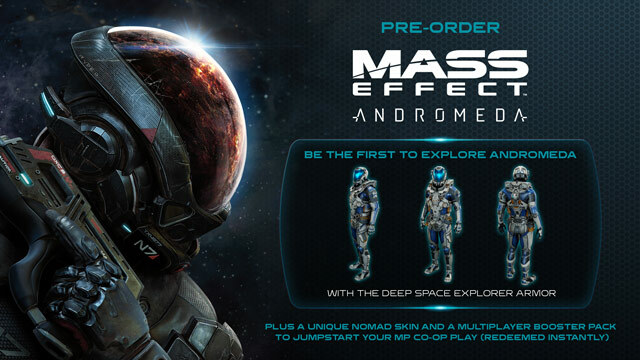 Includes 4 Items: base game, Deep Space Explorer Armor, Multiplayer booster pack and Nomad Skin. Mass Effect 4 starts a new era in the popular SciFi RPG franchise. The adventures of Commander Shepard are over and a new hero will have to step up, taking place far away from and long after the events of the original trilogy. The application of the new Frostbite graphics engine which is also used to create Dragon Age: Inquisition provides high expectations that are even complemented by the first video snippets. In Mass Effect 4, players will get to explore an all-new galaxy, Andromeda, and pilot the new and improved Mako. And through it all, they will have a new team of adventurers to work with, learn from, fight alongside of, and fall in love with. Once again experience an epic, thrilling storyline in the popular ME universe! Developer Bioware promises to consider the desires and criticism of fans, and create a fantastic game based on that - including more than a few surprises. Be the Pathfinder. Chart your own course in a dangerous new galaxy. Unravel the mysteries of the Andromeda galaxy as you discover rich, alien worlds in the search for humanity's new home. Return to the Mass Effect universe you love. Lead the first humans in Andromeda on a desperate search for our new home. In this new chapter of Mass Effect, meet and recruit all-new, interesting characters caught up in an epic space saga filled with mystery and galactic conflict. Battle like never before. New additions like destructible cover, boosted jumps for added verticality, and all-new weapons and Biotics make combat more thrilling than ever. Play your way. Build a formidable hero with amazing weapons, powers and tech. With a much more flexible skill and weapon progression tree, you can replicate your play style to make you unstoppable against powerful alien enemies. Join the APEX Forces. Multiplayer in Mass Effect Andromeda places you into a class-based, 4-player co-op fire-team experience. Team up with three of your friends to take on the enemy threat and protect the interests of the Andromeda Initiative.